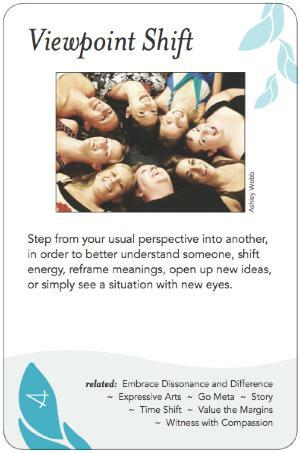 Step from your usual perspective into another, in order to better understand someone, shift energy, reframe meanings, open up new ideas, or simply see a situation with new eyes. Peekaboo: When a face is hidden behind hands, a small child thinks it has gone away, and is delighted to see it return. Over the years we lose this freshness of vision, spinning interpretations to fill gaps in data, and then those interpretations become calicified. (See the Ladder of Inference for more on this.) Shifting Viewpoints is a way to step back into seeing anew. Such shifts are powerful outcome that can emerge in individuals and groups unintentionally, and there are also things you can do to invite it. Another type of Viewpoint Shift is to invite empathy with a participant who might otherwise be in an isolated role. It's the classic "walk a mile in someone else's moccasins"--if you hear and understand someone else's history, you are a lot more inclined to view them sympathetically and act cooperatively as their ally. Viewpoint Shift can also refer to a specific facilitation technique in which two or more people at odds are invited to temporarily swap roles and argue each other's points in front of the group. Whether done as a roleplay or during a real charged situation, this can invite some humour and grace into a stuck point and help provoke shift. When using this technique, it's important that both sides act with respect and do not caricature each other's viewpoint, but instead push it from its best position. ADD IN: Ladder of Inference and that a Viewpoint Shift can take place at any rung on the ladder. Each participant brings to a conversation or other group process, a worldview that is informed by their culture, language and experiences -- "where they come from" -- what their story is, what they know, what they think the group is or should be doing, or what they think is happening. Seeing diversity of perspectives and worldviews as a strength of the group to broaden collective knowledge and understanding, instead of a liability to be negotiated and overcome. This can lead to an impasse, a conflict, a blindness to possibilities, or a lack of appreciation, that can prevent shared understanding, effective collaboration, creative problem-solving or consensus from happening. For example, Bill Mollison broke a group's anxiety about "too many slugs" in a permaculture garden by reframing it as a situation of "too few ducks." This opened up whole new sets of ideas on how to approach the situation. Likewise, when waste managers stopped looking at waste as a problem and started seeing it as a resource, their industry was transformed. This requires getting the group to suspend judgement, and be open to changing their minds about how they perceive something, to open up new possibilities, hence altering preconceived ideas and changing the meaning participants ascribe to what they know and to the issue at hand. When this happens, it can move participants to a position of strength, appreciation and creativity instead of a position of anxiety, helplessness, and conflict. Reframing genius is moving from something that shuts down, that darkens, that removes life, to something that opens, that invites, that gives charge, e.g. from "acceptance of limitations" to "the power of constraints". Story-telling and metaphor can be very effective ways to reframe perceptions and worldviews, as can asking open, and even ambiguous, questions. For example, a group might be feeling stuck, blaming its founder for her unwillingness to follow new procedures aimed at making the group more inclusive. They then learn about life cycles of organizations, and find out that their dilemma is a classic stage in organizational development. So they stop blaming the founder, and learn more about how best to move through that stage transition. Sometimes an issue with a specific person's behavior needs to be confronted. In that case, you can still invite compassion and understanding, but it's not useful to pretend that an issue is not about a person when it is. See Naming. Homogenous fishbowls on gender or other polarities at NFNC summer camp or other consciousness raising events. At a meeting of Greens trying to develop ideas and positions for development and conservation of their island community, a conflict between those who wanted no development and those that wanted high-density, low-footprint-per-capita development, was resolved by reframing the challenge with the question: What will we do when there are no more ferries to the island? Both antagonistic viewpoints were set aside and the group developed a consensual approach from scratch that informed each about the other's worldview and sparked remarkably creative new approaches. At Windsong Cohousing, a member attempted to craft a proposal for business use of common space through consultation with the community. When the community recognized there was too little commonality in perspective to craft a proposal that could get consensus, the member was recognized for pursuing the proposal in the service of the group. This framing (rather than a personalized one) made it easier for all involved to feel good about laying the proposal aside. The "time spirit" or ghost role in Process Work, in which someone in the group role-plays the response of someone not present, which they feel the group needs to hear to move toward wholeness. Debating clubs are a classic way to practice being able to take on any viewpoint without undue attachment. The membership tag is relevant in that through this pattern, the group can in a way include people who are not present.